Collins has chosen to spend one of the last days of his life doing something he loves: walking 18 holes of golf. 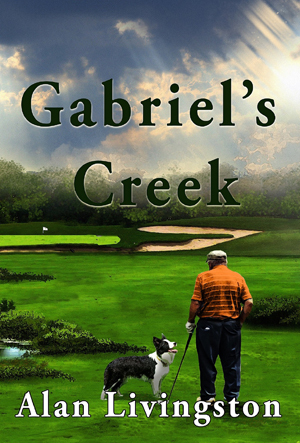 With Ralphie as guide and companion,Gabriel’s Creek itself brings out his reflections on life in a tale about family, friends, and commitment, about dogs and destinations. As his round winds along, the course brings a variety of characters from his past to meet him. These players show much about who Collins is and how he treasured his life’s relationships. Along with them, he is popped into and out of golf holes across two continents. Some are places he has played before, while some he had simply dreamed of before. Is it time travel, or is it just the enchantment of Gabriel’s Creek? The 18th hole is more than the end of Chris’ round. On that final green, Collins finds that Gabriel’s Creek Golf Course exists in neither the earthly nor the next world, but perhaps somewhere in between.